K-ZON: A remote inspection, laser and UT mapping solution. Providing the highest quality quantitative structural data for the management of caisson integrity. Since 2003, Savante Subsea has specialised in the development of 3D underwater laser, photogrammetry and NDT inspection tooling. Deployed using divers, ROV, AUV and bespoke remote intervention tools; we create high precision data for asset integrity management. We provide SAFE, Cost-Effective and Responsive asset integrity data for caisson, riser and J-tube Integrity Assurance. K-ZON moves beyond a conventional caisson inspection and provides the highest-quality 3D structural assessment data for any caisson configuration. This can be supported with content from a highly flexible range of third-party sensing solutions. We provide critical CONTEXT for measurement data. An accurate understanding of the condition of a caisson can support it's ongoing use or provide advanced warning of the need for repair or replacement. Savante pioneered the development of high-accuracy underwater 3D laser measurement. Providing rich, full-colour 3D models of both seam and circumferential welds, our technology goes beyond simple defect sizing and permits the direct 3D comparison of weld and defect condition from inspection to inspection. Rates of deterioration can be directly measured through comparisons of subsequent 3D datasets. 4D laser capture of welds, defects and holes lets you observe deterioration over time. Dual lasers scan the weld simultaneously from both sides; permitting enhanced detection of preferential root weld corrosion issues. Phased Array or ACFM sensors. Cavitation blaster cleaning system for marine growth removal. K-ZON is highly flexible. Variable length sponsons permit centralised use in a variety of caissons. A network enabled node delivers data from any NDT sensor technology. Our experienced design team have the capabilities and experience to overcome challenging inspection problems. K-ZON can be mobilised rapidly from our Aberdeen base at short notice; perfect for quick turnarounds and taking opportunities where they arise. K-ZON was designed to be lowered using any encumbent rope access team with minimal fuss. 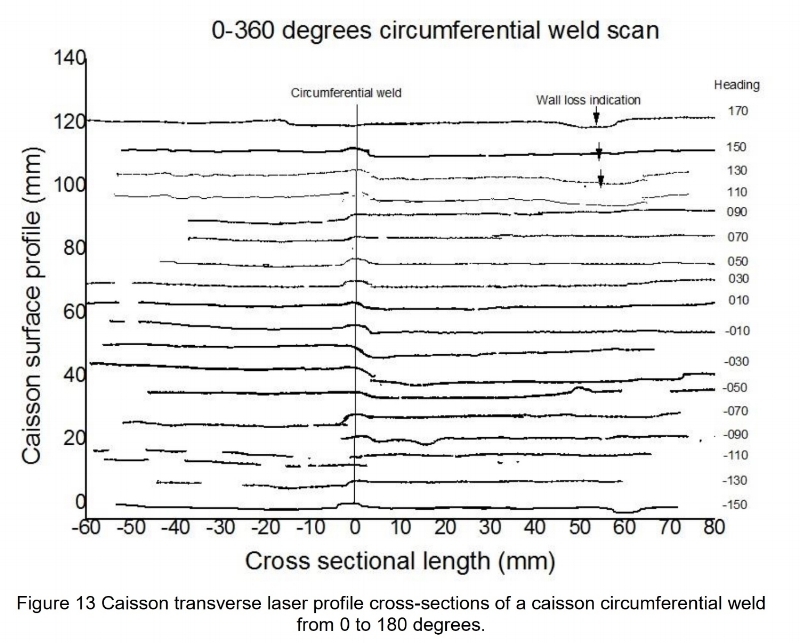 Detection of regions of preferential root weld corrosion and confirmation of wall loss regions in circumferential weld and heat-affected zone (HAZ) from a set of three firewater pump caissons. R.J. Lee, S.F Burch, "HOIS Guidance on In-service inspection and integrity management of caissons". HOIS (13)R6, July 2014.